OK, one final post with photos from my vacation in Laos and Thailand back in December. I put up some children’s photos last time, so this one has a few photos of adults. Most of these were taken around the New Year holiday, but the Lao people like to start celebrating several days before and continue for a few days after New Year’s Day. 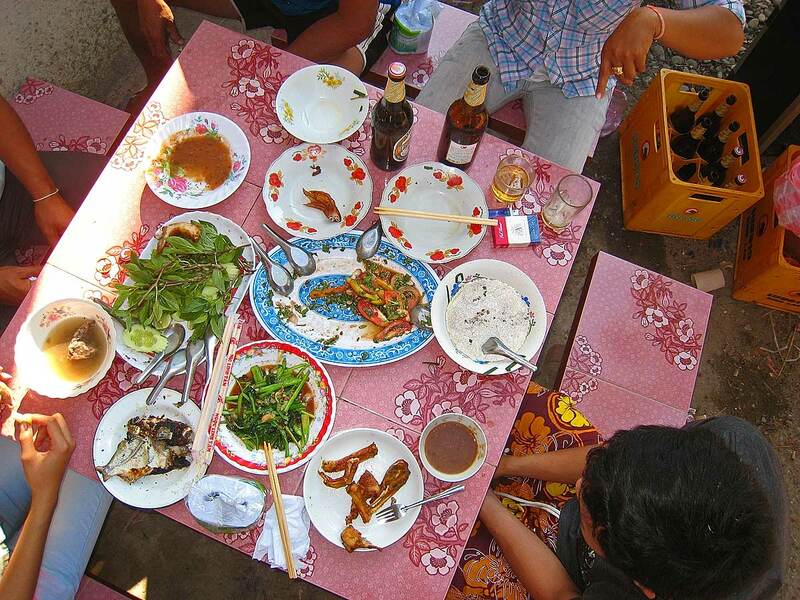 Here’s lunch at Nai’s house on Dec. 31st, eaten by about 7-8 family members and friends. Let’s see, what do we have here? Looks like the remains of some fish, deep-fried chicken feet, various greens, a veggie salad and, of course, Beer Lao. 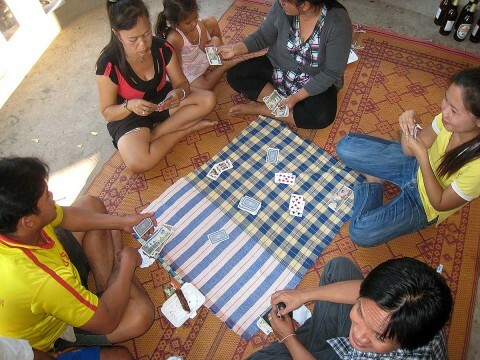 While some of us were eating and talking (with me pretending to listen–I don’t speak or understand the Lao language, yet), other folks, including Nai, were playing cards. It looks like a Lao version of gin rummy, I guess, with small wagers included. 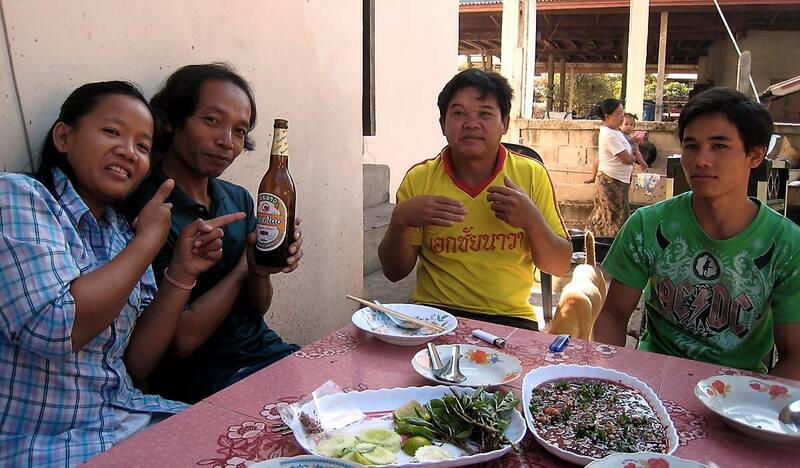 These are a few of Nai’s brother’s friends, who are working on a good-sized platter of semi-congealed cow blood soup. Various herbs are thrown into the soup, along with a couple of hands full of peanuts. Yummmm! Nai’s sister Nui is on the left. Next are Nai’s brother Pui (Poo-ee), in the center, flanked on the right by cousin Mot (Maht) and on the left by another lovely cousin, whose name I’ve forgotten. Mot’s mother (one of Nai’s sisters) and father live and work in Thailand, but he was visiting the homestead for a few weeks. I mentioned to Nai that Mot didn’t appear too happy to be here, but Nai told me he wasn’t happy to be going back to Thailand (and to school) soon. The young lady asked me, through Nai, to find her a Western boyfriend. I told her I’d put her photo on the internet, so here it is. 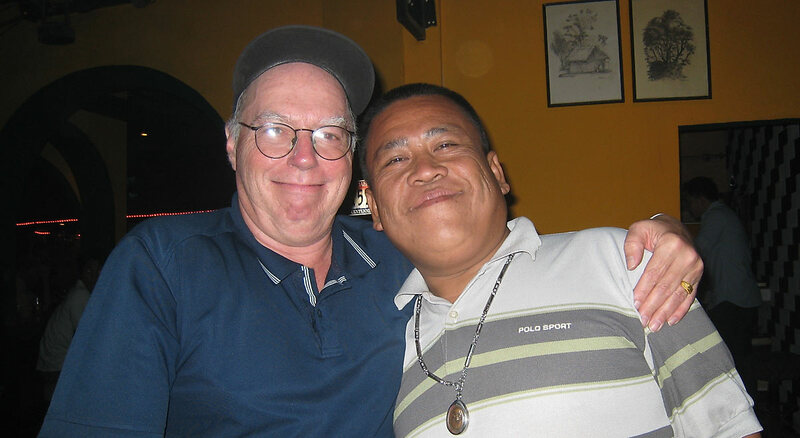 The day before, on the 30th, Nai and I were in Vientiane visiting a Lao friend’s pub. While shooting pool, Nai introduced me to a friend of his from Nai’s village. He’s a policeman in Vientiane, I believe, and a very friendly fellow. 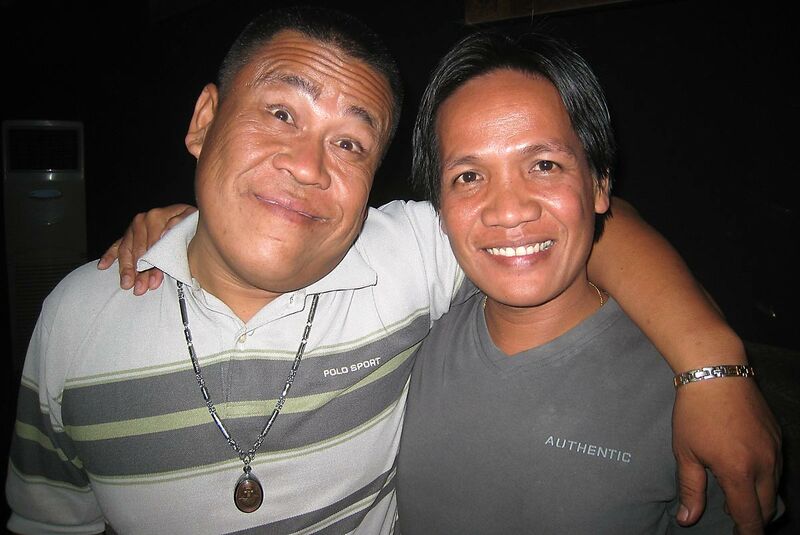 Here he is, posing with Nai. “Since Chao Anouvong is remembered for reuniting the country, his statue will depict the strength of his leadership, and should be as close to lifelike as possible,” said Head of the Ministry of Information and Culture’s Fine Arts Department, Dr Bounthieng Siripaphanh. The statue, which is costing about 5 billion kip to make, will stand about 8 metres high and 3 metres wide. The king will be represented holding a sword in his left hand while gesturing with his right. One of the greatest achievements of Chao Anouvong’s reign was the construction of Vat Sisaket, Vientiane’s oldest standing temple today. 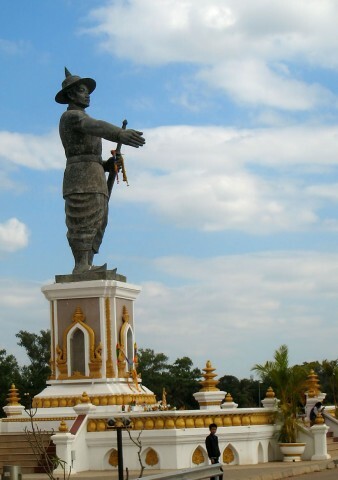 Modern Lao nationalist movements, on the other hand, have turned Anouvong into a hero, even though his strategic and tactical mistakes combined with his hot temper led to the end of the kingdom of Lan Xang (Million Elephants) destruction of Vientiane, and a permanent division of the Lao people between the country of Laos and the Lao-speaking provinces of northeastern Thailand. Hero or not, it’s still an impressive statue. 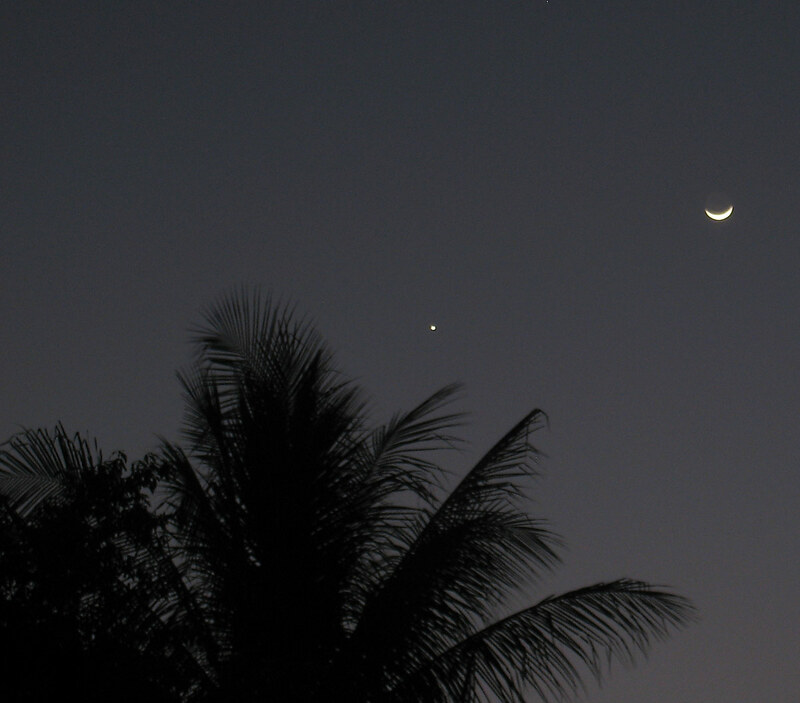 That wraps up my vacation to Thailand and Laos, so we’ll be goodnight and adieu, until next time.